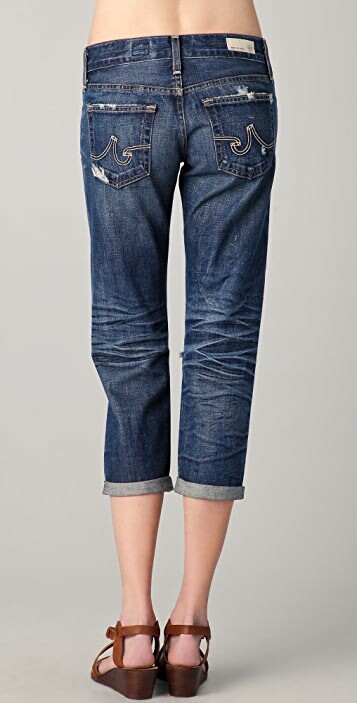 These cropped jeans feature 5-pocket styling and a single-button closure. Contrast logo stitching at back pockets. Whiskering, shredded holes, and heavy distressing. * 8.5" rise. 26" inseam. Purchased a size larger based on reviews below but when i tried it on, it was too loose on me. A big gap on waist band when sitting down so i returned it and ordered my usual size. A very comfortable pair of jeans and i can't stop wearing it. my usual size is 26. but this one 26 is a little bit tight around waist. i guess one size up will be more comfortable (besides, this jeans does not strech). However, i'm still happy with this purchase. love the style and color. I am normally a 28 in designer jeans. Got a 29 in these, reviewers said they ran slightly small. I am 5'5 and 130#. They are a looser fit but they are supposed to be. 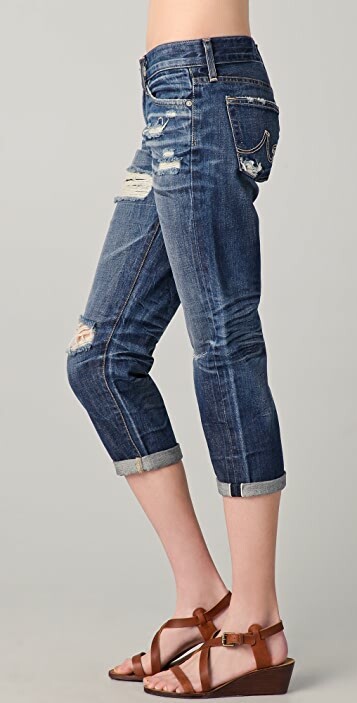 Love the distress and they are a very sturdy jean. I have never bought the brand and they are great. Very happy and will wear a lot. Iam normally a size 25 in all brands however, I purchased these jeans in a size 24 since I usually size down a size or two in boyfriend jeans since i like them not as baggy just relaxed. These however were too tight and I was not able to do up the button. I actually had to go up a size to a 26 from my normal 25. I am glad I didin't size up. I ordered size 24. when I wear this jeans the picture just like the one of the red clothes model. I like it. I can't stop wearing these! The fit is so flattering, the construction so sturdy, and the options so endless that I find it very hard to wear any other jeans. Every pair of denim shorts I bought for the season has been abandoned in favor of these. I also love that the cuff isn't stitched down, so you can readjust the thickness of the cuff and the inseam length (I prefer it slightly higher if I'm wearing flats.) I am usually a size 25 in AG, but I recommend going one size up for these as the waist seems to be slightly smaller than usual and doesn't have much stretch. I just received these today & love them! 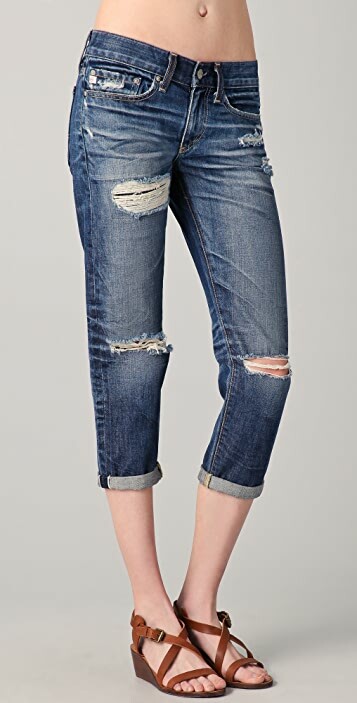 Yes, they are expensive, but totally worth it if you're looking for a great-fitting, higher-rise crop in a beautifully destroyed wash. After reading the 2 previous reviews, I went with my "gut" & ordered my normal size in premium denim, a 27. I have several AG's and always wear a true 27. They are snug at first but stretch just a little upon wearing & doing knee-bends for 5 minutes. :) My current favorites are the ex-boyfriend crops (I have 3 pairs! ), and these fit similarly with the higher rise, just a lot more snug/tight all the way around. For reference I am 5'6" with a curvy/athletic build & usually wear a 27/4 in jeans. Bottom line: if you're looking for something roomy, get the ex-boyfriends. If you want something more fitted, then these Pipers are perfect! Most of us are past the days of sewing little patches on or embroidering rainbows where they rip. My advice--get them anyway. The fit is a little tight but they look good with boories and will look good with little heels. I'd say no matter how you wash them, count on them looking like they do through the Fall--period. I forgot to say, I love them.